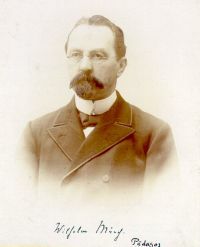 Wilhelm Münch, scholar of pedagogy, upper secondary school teacher in Berlin. Vademecum Philosophicum, darin die kürzlich erworbenen Bibliotheken: W. Diltheys, Otto Liebmann, W. Münch, K. Lasswitz, G. Thiele, und Bücher aus den früher erworbenen Bibliotheken: Max Heinze, Eduard Zeller, H. Ebbinghaus, Jac. Freudenthal, Ed. von Hartmann, Th. Vogt, G. und O. Frick, Leipzig, Lorentz 1913, 168 p.
The catalogue groups together the libraries of Dilthey, Liebmann, Münch, Lasswitz and Thiele, adding works from the libraries of Heinze, Zeller, Ebbinghaus, Freudenthal, Hartmann, Vogt, G. and O. Frick. The origin of each volume is not indicated. The organization of the second part of the catalogue is particularly interesting. It is by far the longest (pp. 16-168), so that it represents a sophisticated bibliographic repertory. The authors are placed in alphabetical order (A. v. Helmersen, H. v. Helmholtz, H. F. Helmolt, Helvétius, etc.) and their works are marked by progressive numbers (12,566 bibliographic descriptions). Critical studies are often associated to single authors (for example, the forty titles of works by Spinoza are immediately followed by 97 texts of secondary literature). The list also contains some key words which refer back to authors of works connected to that topic: after A. Spir, there are therefore the key words "Spiritismus" and "Spiritualismus", after R. Sporbert there is the key word ‘Sprachphilosophie’. Some works are marked with an indication to consult a certain key word as well (the work of Agrippa von Nettesheim is marked with the indication to consult the key word "Geheimwissenschaften"). The repertory is divided into two different sections.